Benedict XVI’s quiet revolution, last act: Caritas Internationalis What is behind the Vati-leaks war? Benedict XVI. Between Benedict, Bonaventure and Gregory. Quaerere Deum, search for God. This was the motivation that brought so many people to begin the era of monasticism in Europe. Benedict XVI outlined it in his speech to College de Bernardins in Paris. «Find the monk that lays inside you»: this is how – according to Giuseppe Della Torre, president of the Vatican Court – that speech of 2008 could be summarized. In some ways, Benedict XVI’s Pontificate has been characterized by a certain similarity with what monks did in the past. Is Benedict XVI the last of Benedictins? Is Benedict XVI working in order to reform the Church as Gregory VII did? Is Benedict XVI interpreting his pontificate following the example of Bonaventure of Bagnoregio? This last has been a sort of polar star for Benedict XVI. It was precisely on Saint Bonaventure’s theology of history that the young Joseph Ratzinger published, in 1959, his thesis for certification to teach theology. The novelty of this early text was that it compared, for the first time, Saint Bonaventure’s theology of history with the highly influential version of Joachim of Fiore. Bonaventure – Benedict XVI said in the 10 march 2010 general audience – addressed the problem of the influence of Joachim Fiore, who affirmed – according to the Trinitarian rythm of the history he outlined – that the third age, that of the Holy Spirit, was up to come, and that the arousal of this new time would come from a new monasticism. Joachim of Fiore affirmed that St. Francis and the new community he created, so different from the monasticism known up to then, called for a new interpretation. Bonaventure understood that there was the practical need to embody Joachim of Fiore ideas in the reality of the hierarchical Church, and this had to be done on the basis of a theoligical foundation. He also knew that – although taking into account the necessary realism – it was not necessary to lose the novelty of St. Francis. This is the reason why Bonaventure harmonized the positions. He remembered that Jesus Christ is the last word of God: in him God has said all, giving and expressing himself. At the same, Bonaventure underlined that Church is not immobile, fixed in the past and that novelties cannot be exercised in her. «Opera Christi non deficiunt, sed proficiunt», the works of Christ do not go backward, do not fail, but progress, says the saint in the letter De tribus quaestionibus. Christ is not the end of history. He is the center of history. Bonaventure’s harmonization method is at the basis of Joseph Ratzinger’s method. This was precisely the reason why the Papal pastoral visit of yesterday to Arezzo, Sansepolcro and La Verna – where in fact Benedict XVI could not go because fog and bad weather made the trip impossible – the Pope would have read a passage of the Itinerarium Mentis in Deum of Saint Bonaventure. The one-thousandth anniversary of San Sepolcro – the first town founded on the basis of a theological project – has been celebrated by Benedict XVI his way. He affirmed that «today there is a peculiar need that the service of the Church to world is made up by enlighted lay, able to operate within the City of Man, willing to serve looking beyond the private interests and the interests of only one part», and invited people to rediscover Christian roots. And there it comes the Benedictin spirit of the Pope. When Joseph Cardinal Ratzinger took the name Benedict XVI in late April, observers immediately speculated as to what it meant. Although Benedict XVI has pointed to his desire to carry on the legacy of Pope Benedict XV (1914—22) as a primary reason behind the name, his choice of Benedict naturally called to mind St. Benedict of Nursia (c. 480—547), by far the most important figure in the history of Western monasticism. Some have said that just as St. Benedict and his monks rescued Europe during a time of general collapse, Pope Benedict hopes to rejuvenate a Europe adrift from its moorings, overcome by relativism, and unwilling even to reproduce itself. Although many people know that St. Benedict’s monks were responsible for preserving much of the literature of the ancient world, that is where their knowledge of the subject ends. But the more familiar we are with the monastic tradition and its essential if largely unknown contributions to the West, the easier it is to understand why St. Benedict has vied with Charlemagne for the title of Father of Europe. In the speech at College of Bernardins, the Pope explained that «it is through the search for God that the secular sciences take on their importance, sciences which show us the path towards language. Because the search for God required the culture of the word, it was appropriate that the monastery should have a library, pointing out pathways to the word. It was also appropriate to have a school, in which these pathways could be opened up». 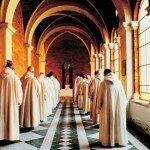 Benedict called the monastery a dominici servitii schola. 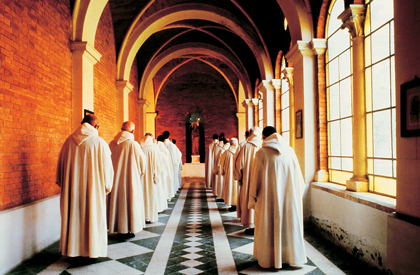 «The monastery – he explained – serves eruditio, the formation and education of man – a formation whose ultimate aim is that man should learn how to serve God. But it also includes the formation of reason – education – through which man learns to perceive, in the midst of words, the Word itself». But there is also the need for a further step. «The Word which opens the path of that search – the Pope said – and is to be identified with this path, is a shared word. True, it pierces every individual to the heart (cf. Acts2:37). Gregory the Great describes this a sharp stabbing pain, which tears open our sleeping soul and awakens us, making us attentive to the essential reality, to God (cf. Leclercq, p. 35). But in the process, it also makes us attentive to one another. The word does not lead to a purely individual path of mystical immersion, but to the pilgrim fellowship of faith». And there it comes the character of Gregory the Great. His search for God brought him to strongly reform the Church. That of Gregorian reform is an heroic enterprise, brought on by a few man that works to re-moralized their society and so purify the Church. People gathered around Ildebrando of Soana begins a movement whose effect were so vast that a whole world change. Will this happen with the Benedict XVI’s Papacy? Elected Pope with the name of Gregory VII, Ildebrando did not only care about the purification and moralization of the Church. He also began a movement to collect ancient sources, so creating a corpus of papers that will be the first global law of the world, the Canon Law. Gregory also defended the autonomy of the Church – its power standing upon any other power -, and organized the Pontifical Legates network. He established two kind of Pontifical Legates: the one in loco, charged by the Pope to look after the application of Gregorian reform on a territory; and the one sent by Rome to accomplish mission in a foreign countries. In some ways, Benedict XVI is changing the way Vatican diplomacy is ruled: he appointed Charles J. Brown, a non-diplomat that served in the Congregation for the Doctrine of the Faith, as Papal nuncio to Ireland; and even Tarcisio Bertone, secretary of State, is not a career diplomat, but a canonist that wants to be considered a Secretary of Church, more than of State. Benedict, Bonaventure, Gregory VII: Benedict XVI’s pontificate is articulated through this three monastic characters. More: it is articulated on quaerere Deum. And this search for God is intended to have a less worldly Church, and to bring it back to God. The climax of Benedict XVI’s Pontificate will surely be the Year of Faith, and the Credo that will conclude it in every diocese of the world.